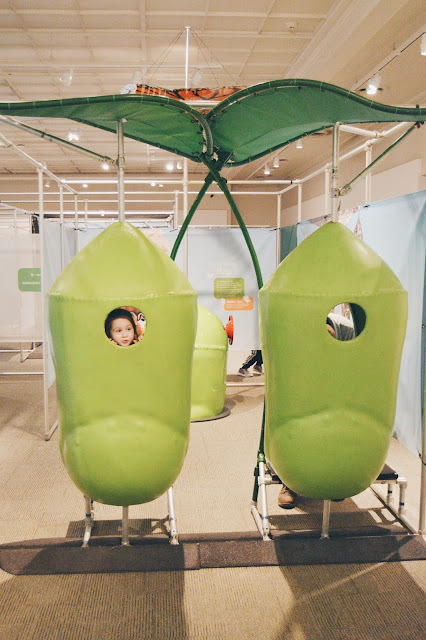 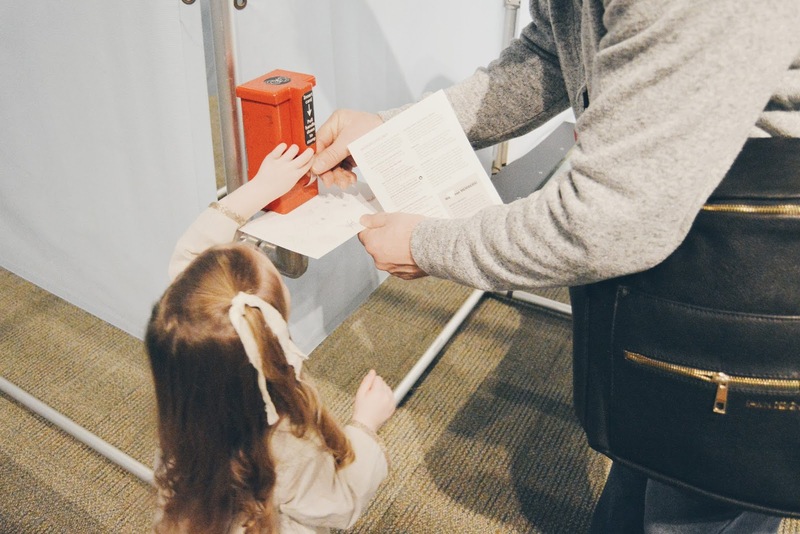 Recently we had the opportunity to visit Carnegie Museum of Natural History and it was such a fun day. 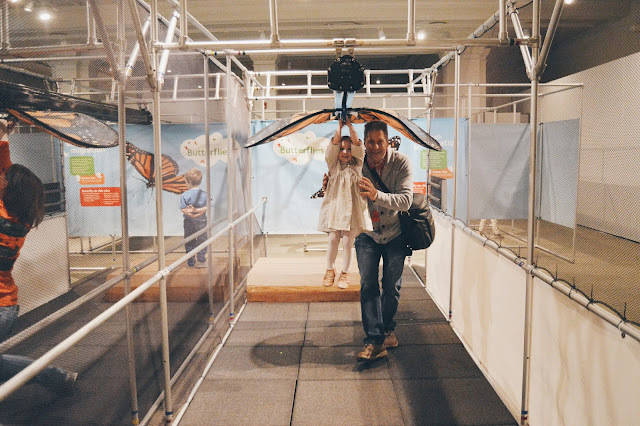 We woke up early one Sunday morning, got ready and headed out in the direction of Pittsburgh Pennsylvania. We stopped for bagels and juice at Einstein Brother's bakery and loaded up on Jalapeno Cheddar bagels, Cinnamon and Sugar bagels and Honest Kids Juice boxes for Bella, goodness were they ever delicious and quite filling too! 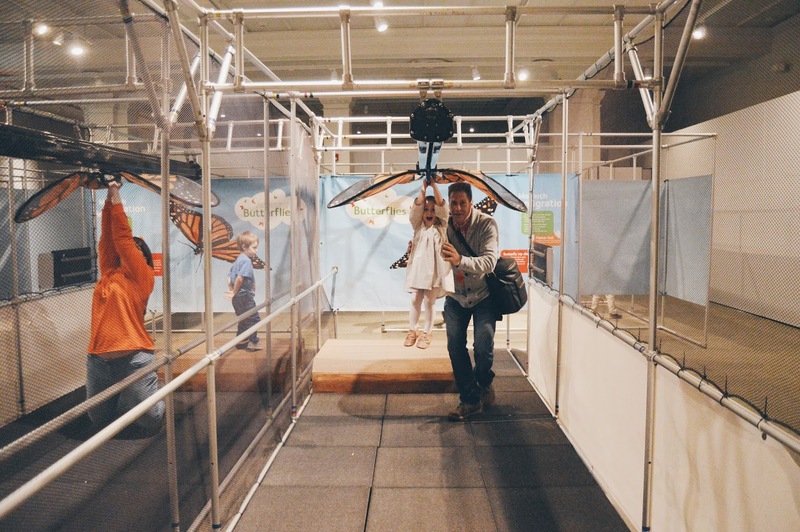 From there we got on the road again and before we knew it, we were pulling into the parking lot at Carnegie Museum! 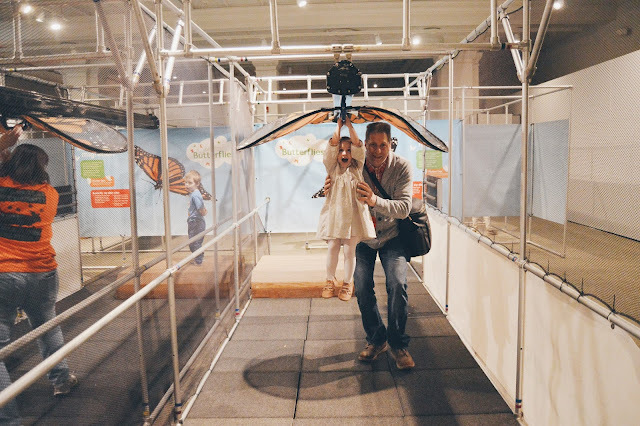 We got there quite early, about 30 minutes early, but we headed on in and sat at the cafe, browsed the gift shop (omg seriously some of the cutest items ever for sale, and really reasonable prices too), checked out the pretty cool digital panoramic photo display and got our tickets. 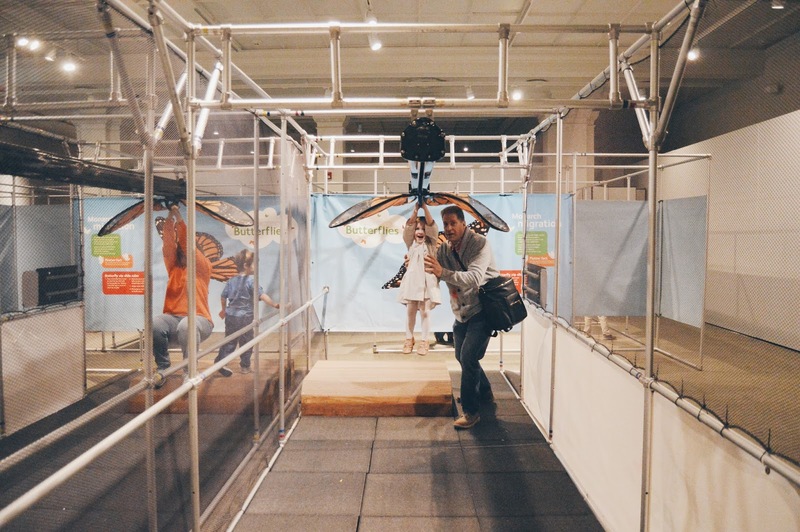 Once the museum had officially opened, we headed towards the "Amazing Butterflies" Exhibit! 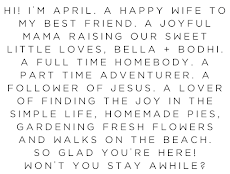 And it did not disappoint! 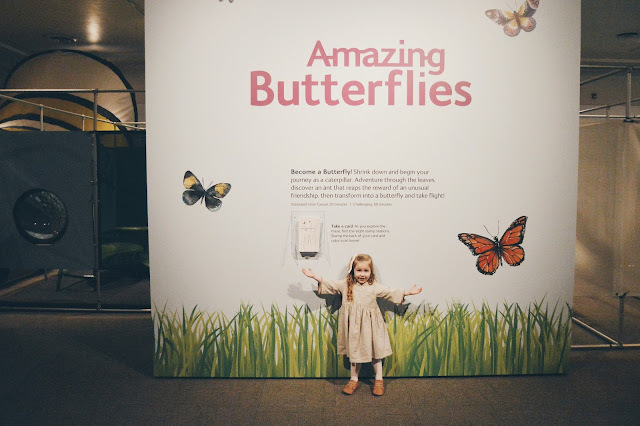 We almost stopped to look at the Butterfly gift shop, but hubby dragged us (me lol) away from there (though we did go back afterwards and purchase a beautiful butterfly print for Bella's bedroom) into the actual exhibit and we got to learning! 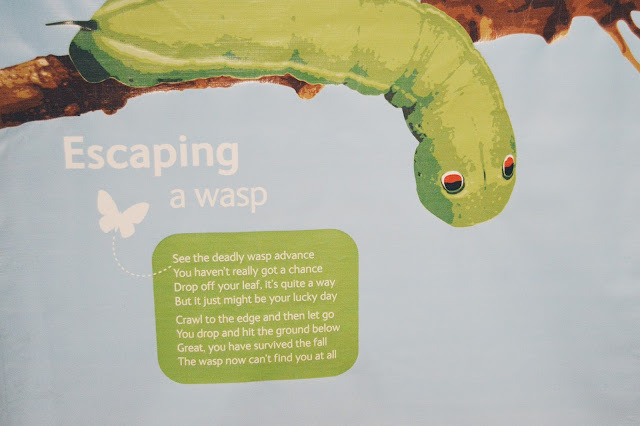 When you head through the doors of the R.P. 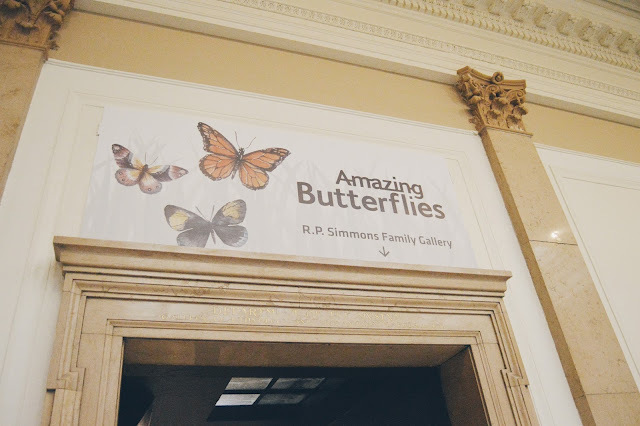 Simmons Family Gallery you are instantly shrunken down to the size of an insect, transported into the amazing lifespan of a butterfly, from start to finish. 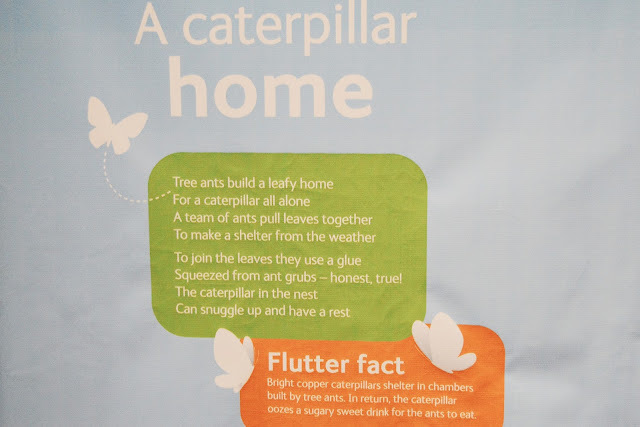 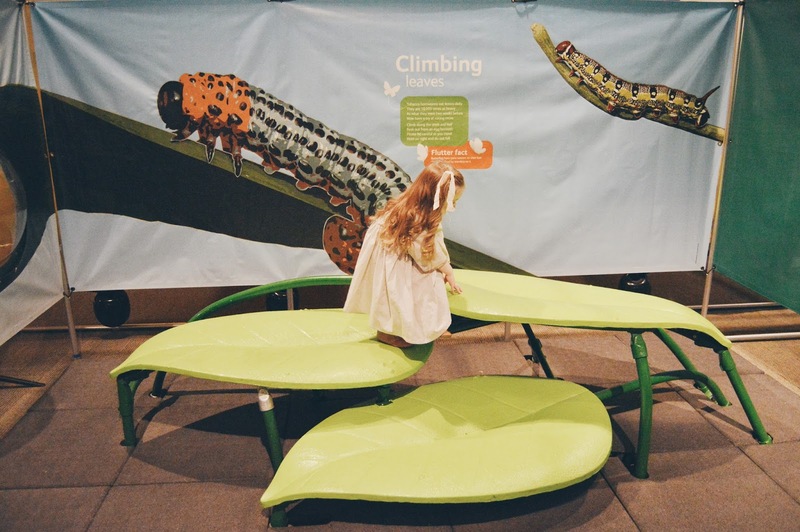 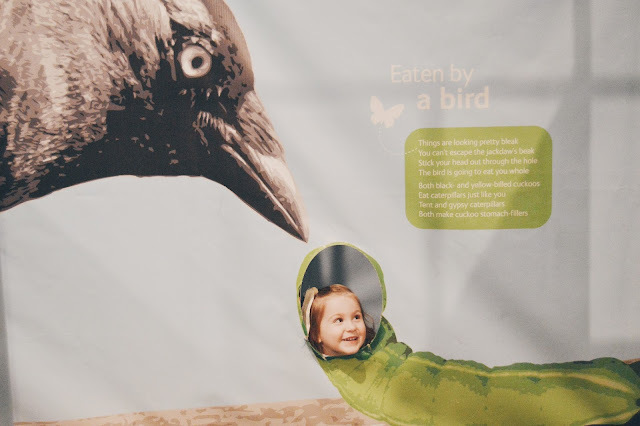 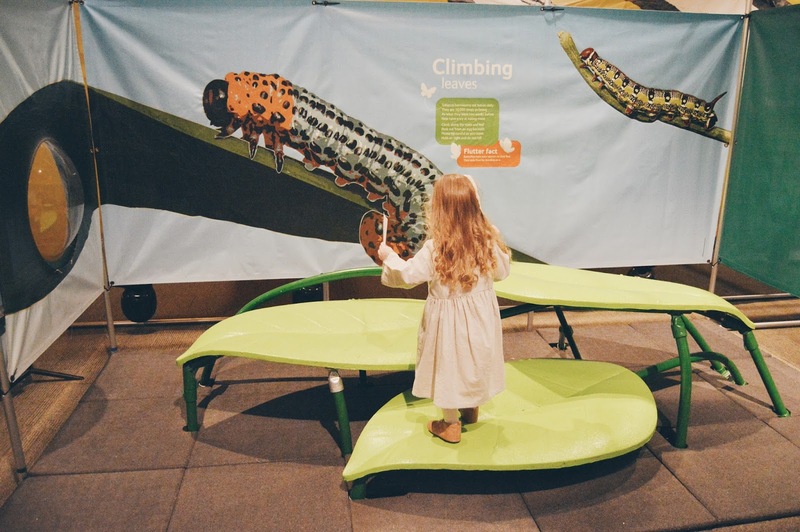 Walk through a caterpillar tunnel, and start learning all about these amazing creatures! In the Amazing Butterflies Exhibit maze, you (little ones and parents alike) will climb into a pupa pod like a little caterpillar to turn into a butterfly, children can climb on "leaves", "feed" the caterpillars with a beanbag toss game, have giant "plants" brush up against you, smell the aroma of what attracts a butterfly mate (think honey smell), discover how butterflies choose a hosting plant to lay their eggs on... and my personal favorites... flutter your wings for the first time, and also flyyyyy for the first time! 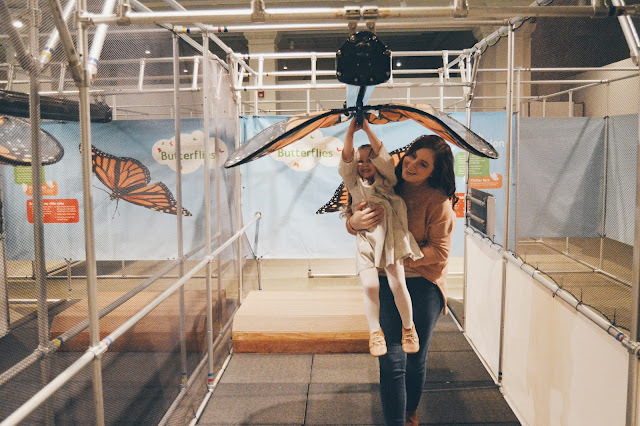 it's really such a magical experience as well as a big educational experience, we learned so many new facts about butterflies that we didn't know and it was really interactive. 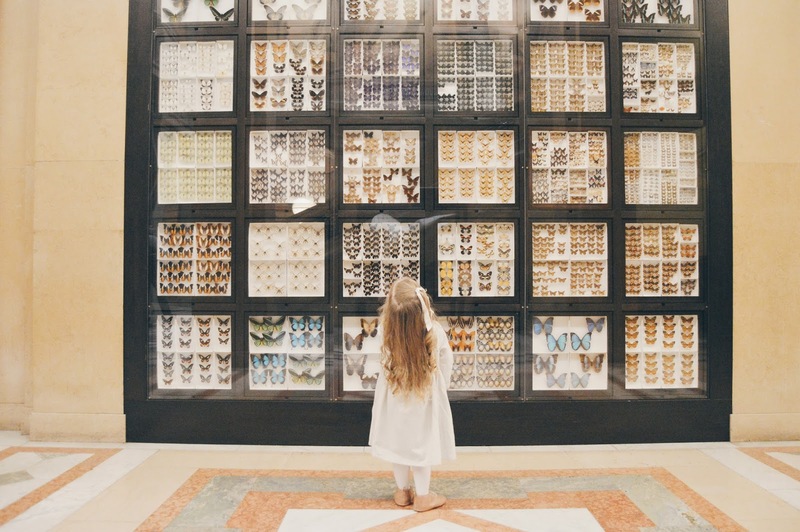 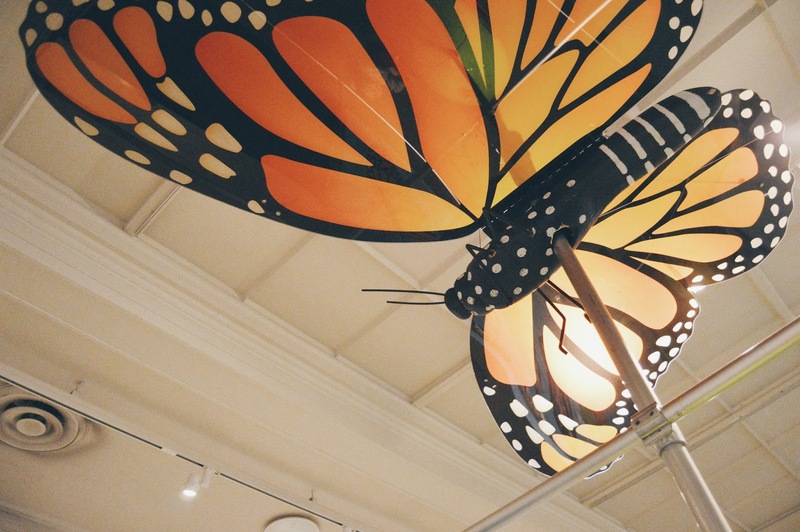 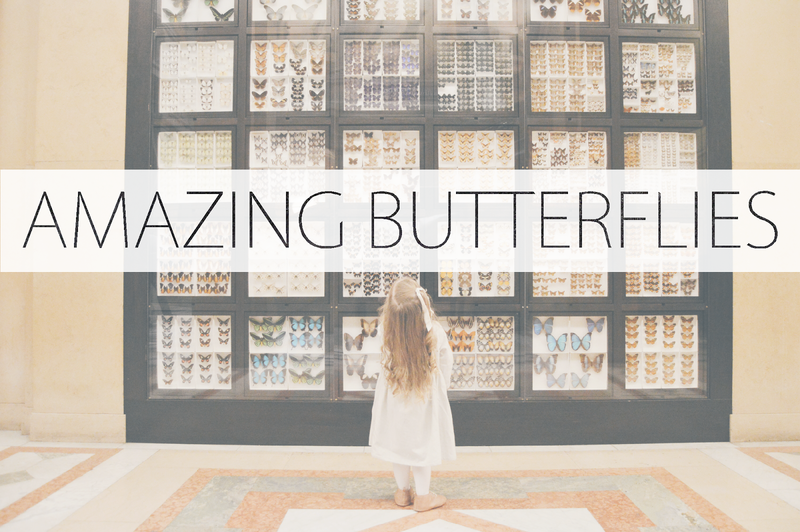 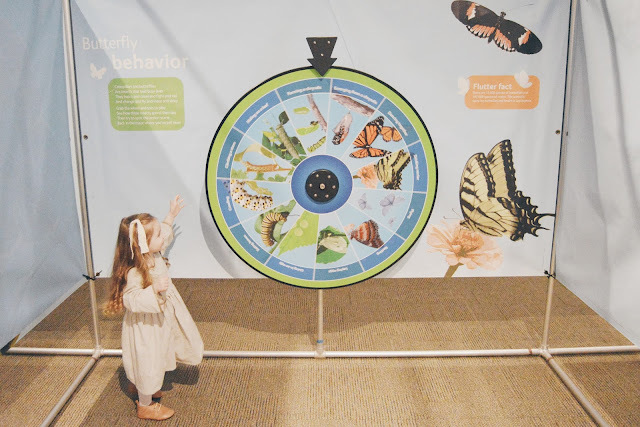 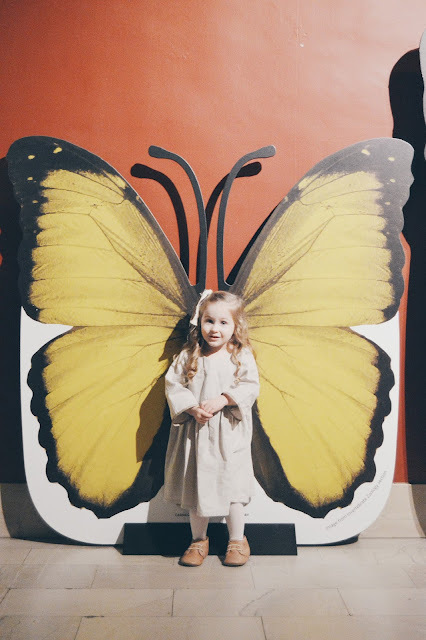 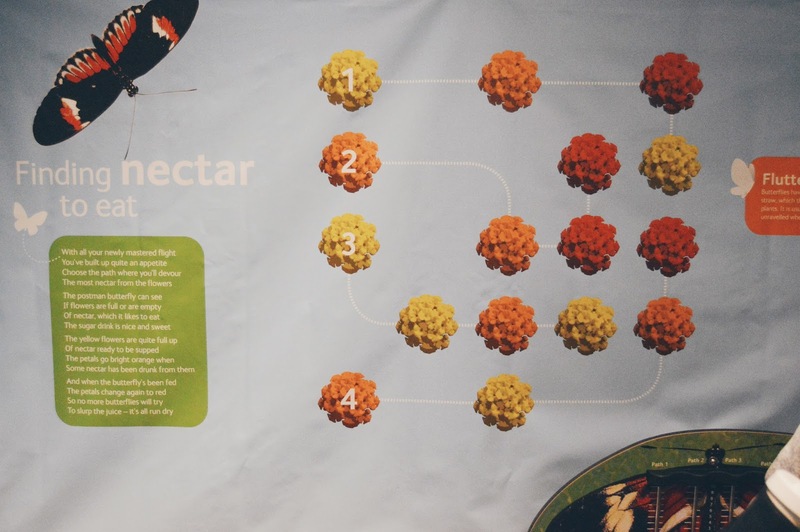 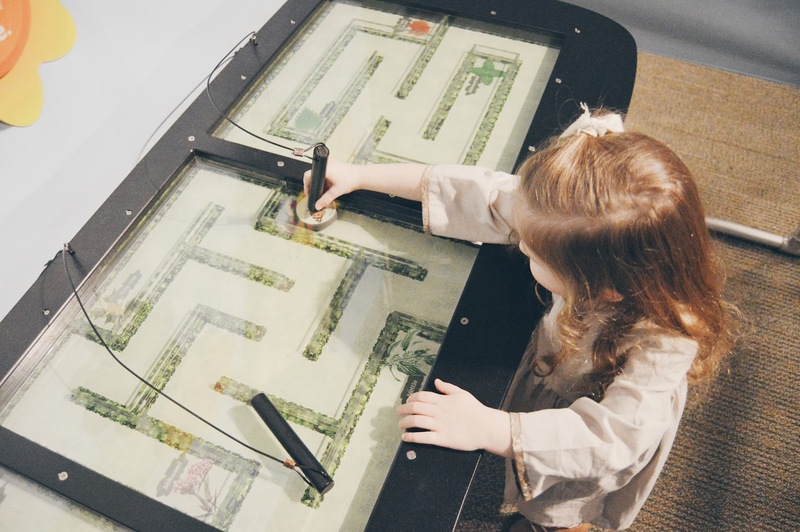 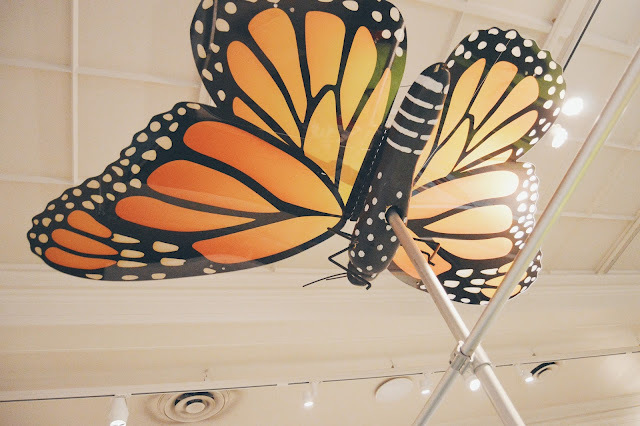 Whether your child attends a public school, a charter school, a private school, or are home-schooled, they'll all love this exhibition and all learn so much from it, maybe even develop a lifelong butterfly fascination! 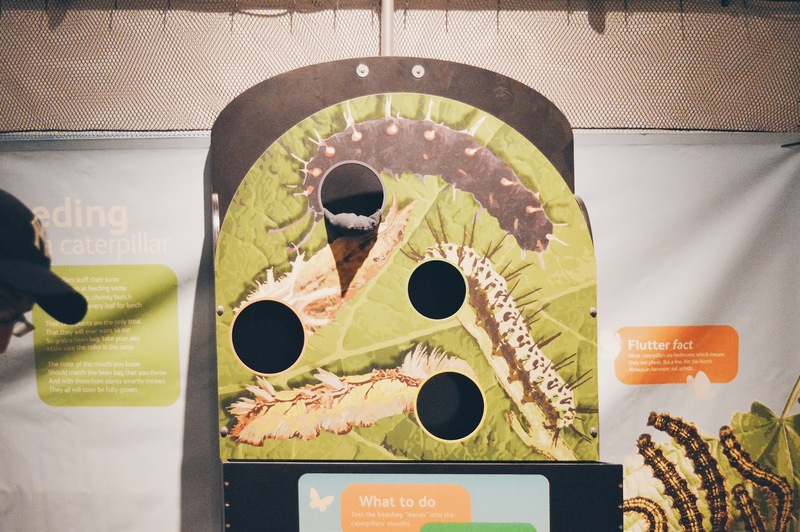 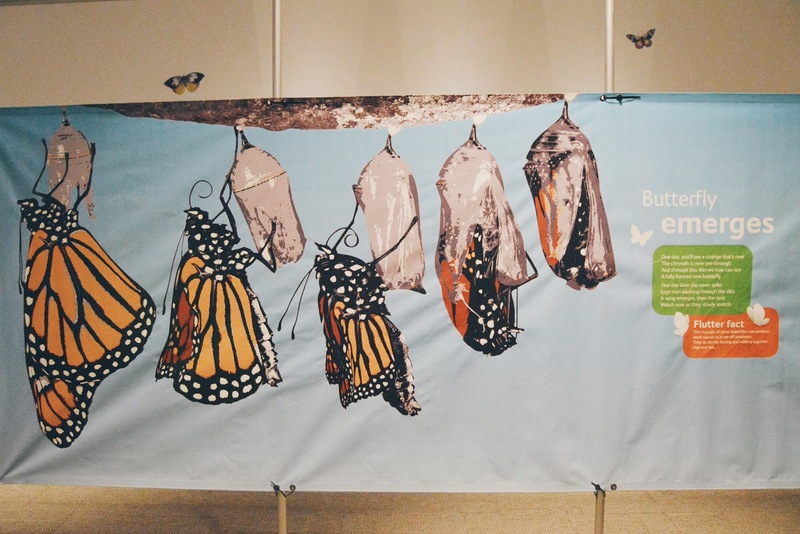 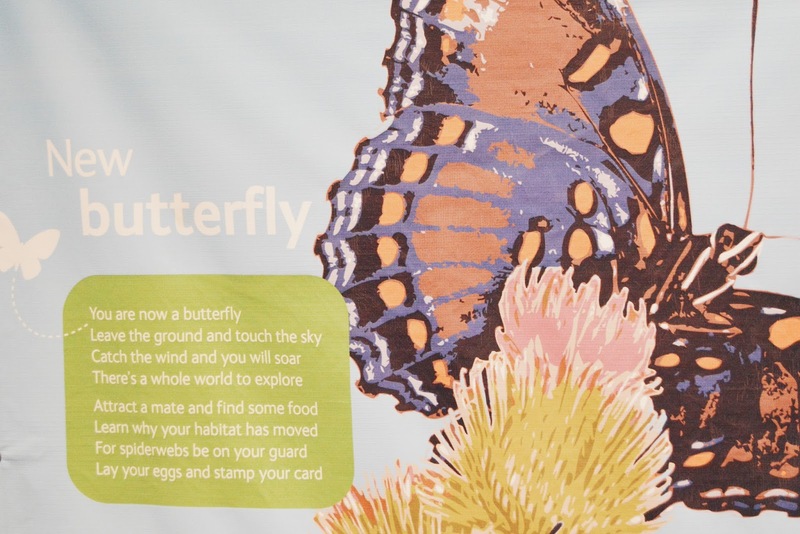 Adults will also love this exhibit and come away from it with a deeper learning of butterflies and their life cycles! 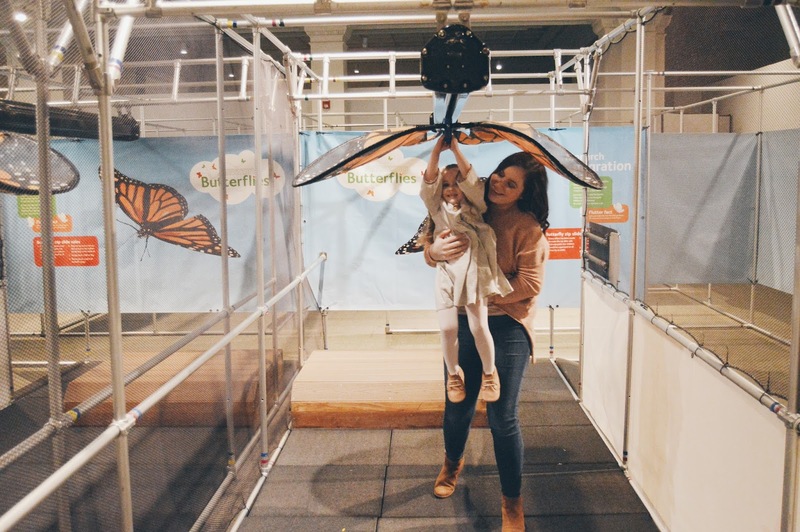 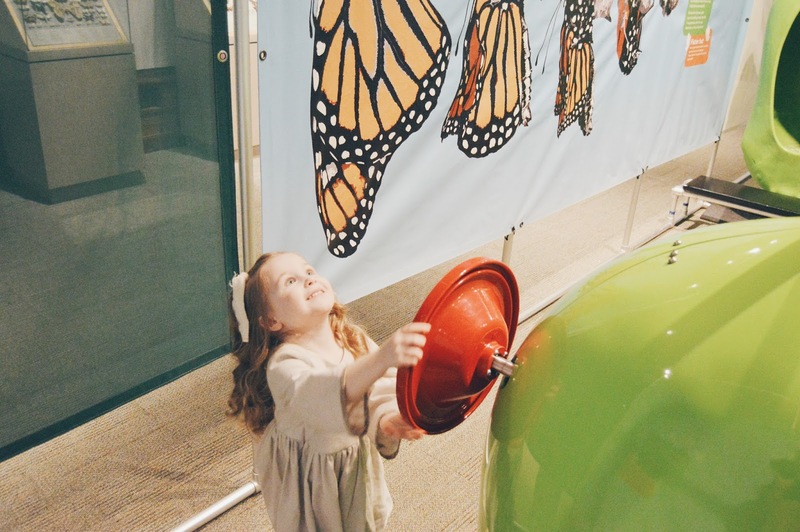 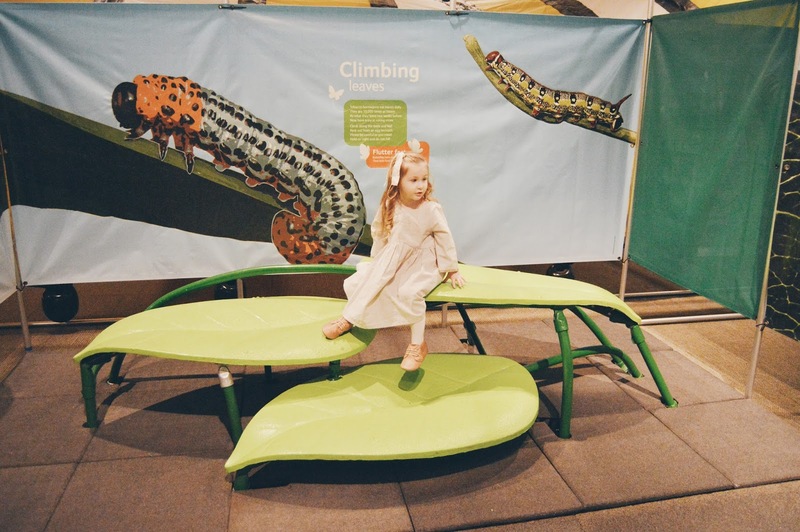 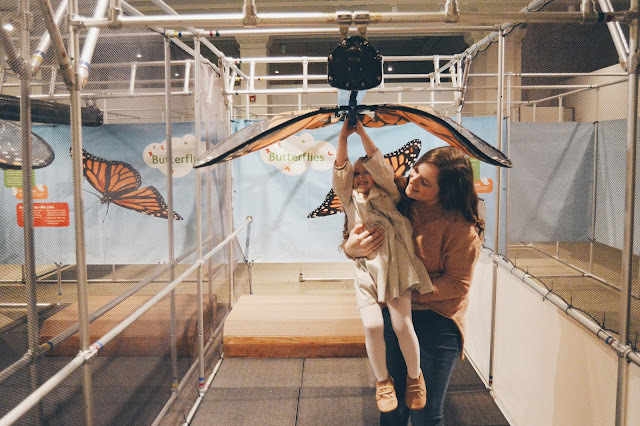 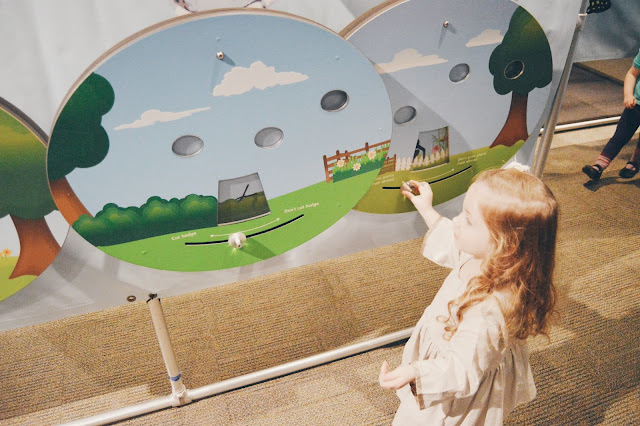 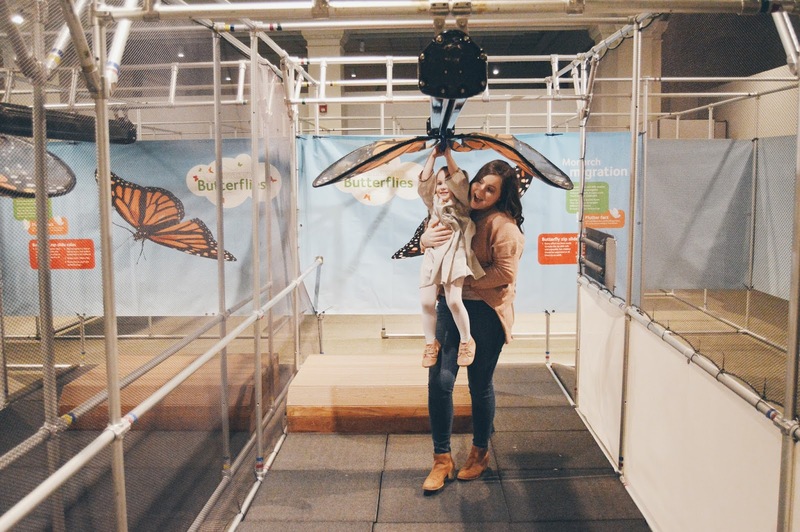 I've only touched on a small portion of all of the amazing activities and fun things the "Amazing Butterflies" Exhibit has to offer, but I don't want to give away too much so you will go see it yourself! 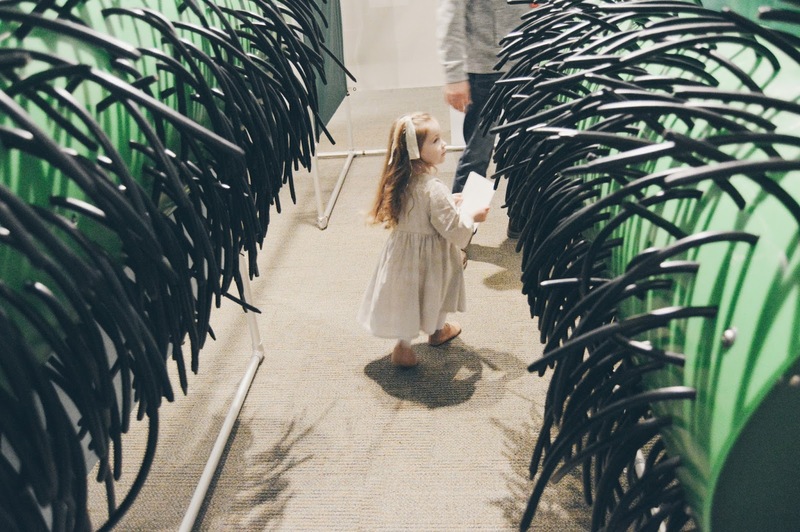 If you're in the Pittsburgh area (or anywhere within driving distance really) this is something you definitely need to go see for yourself, and don't forget to check out the rest of the museum, it's quite the showstopper and Bella especially enjoyed the dinosaurs and mummies. 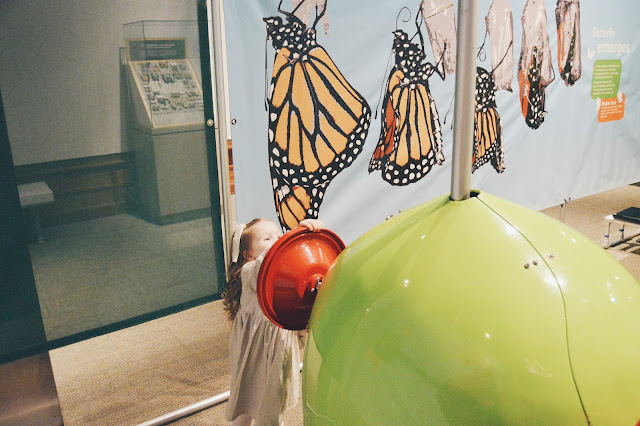 Head over to the Carnegie Museum of Natural History and check it all out!